The brisk winter air failed to deter crowds as thousands made their way to Liverpool’s Chinatown and the surrounding areas to celebrate Chinese Year of the Pig in spectacular fashion. The annual event saw the home of the oldest Chinese community in Europe welcome street performers, martial arts demonstrations and two parades on the final day of the much-anticipated occasion. Eager spectators were treated to a firecracker display following the joining of the unicorn, Dragon and Lion parades at Great George Square before both continued on their separate paths followed by eagle-eyed fans close behind. The square also played host to the family zone area throughout the day, which included Shadow Puppet Theatre, lantern making and calligraphy workshops, storytelling and dance sessions, with both adults and children in participation. 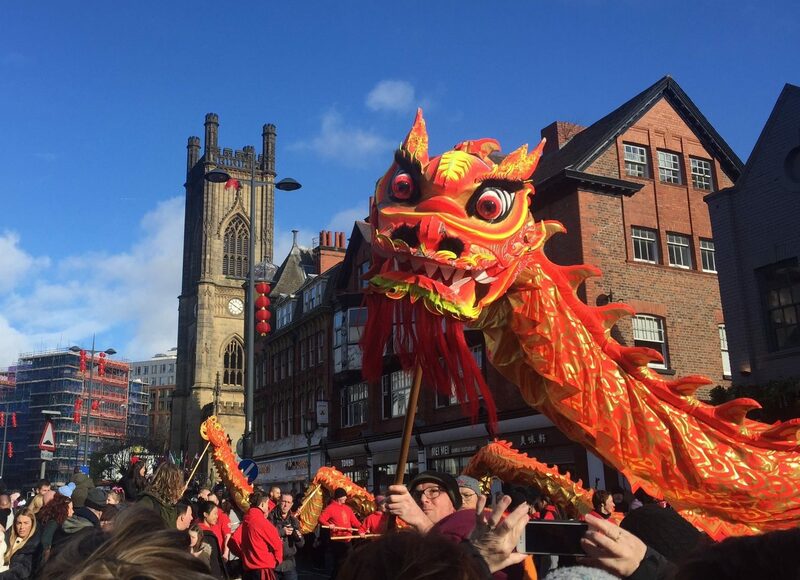 Crowds were wowed on Friday and Saturday with an illuminated lion and dragon dance in a symbol of good luck and fortune. Performances from British and Chinese students dressed in traditional costume blended a soundtrack varying from opera to hip hop following a partnership with Pagoda Arts, Everyman Playhouse and Liverpool Confucius Institute. Each day culminated with a quest to the arch where a 12-minute projection and pyro show took place ,depicting the journey of a little girl and a pig from Shanghai to its twin city, Liverpool. Famous Liverpool landmarks such as the Bombed Out Church, St George’s Hall, Sefton Park Palm House and the Town Hall were lit up red over the weekend to mark the occasion, whilst Chinese lanterns have decorated the city since the end of January. In the Chinese zodiac, the pig is the 12th of all the animals and is the symbol of wealth for those born in the ‘pig’ years: 1935, 1947, 1959, 1971, 1983, 1995, 2007 and 2019.